For twenty years, I have been commenting on how the themes and plot of Ray Bradbury’s dystopian tale of book-burning Fahrenheit 451 are coming to pass. My initial article on this subject was entitled, “How Fahrenheit 451 Trends Threaten Intellectual Freedom.”  My friend Bradley Smith initially published it on the original CODOH Website in 1997. From then, it was revised and reprinted several times. In 1998 it was translated and published in German. It was also included in the Greenhaven Press Readings on Fahrenheit 451 as part of their Literary Companion Series. The article was also published in the short-lived journal The Revisionist  where it was distributed to college students as an insert in their campus newspapers. Ironically professors and students on the campus of St. Cloud University chose to burn the offending journal. Indeed, acts of book burning and censorship are a threat to today’s supposedly democratic societies and our notions of intellectual freedom. As I researched the matter I found that one publisher alone (Castle Hill Publishers) had 68 print books and 72 Kindle books removed from sale. At first it was difficult to determine the full magnitude of Amazon’s action since when a book is removed from sale, it literally vanishes without record. Amazon’s EBook Subsidiary (Kindle) contacted Castle Hill on 6 March and informed the proprietor that several titles were in violation of their content guidelines. The ludicrously vague guidelines include this statement on offensive content, “What we deem offensive is probably about what you would expect.”  It is worth noting that other publishers were likewise impacted by Amazon’s action and that several titles that are no longer available dealt with subjects other than the Holocaust. Within days of the action by Amazon, I commented to several friends that “we all knew this day would come” and noted how the trends identified in Fahrenheit 451 and Orwell’s 1984 were upon us. Optimistically one correspondent responded that we were not quite there yet. He explained that while the German thought-police will come and search your house for any trace of an objectionable book or the data to produce it, they will only confiscate such materials – they won’t burn your house down afterwards. He went on to note that in the US there has been no government action against publishers. While we do have that to be grateful for, it remains clear to me that Fahrenheit 451 trends are indeed coming to pass at an alarming rate. You must understand that our civilization is so vast that we can’t have our minorities upset and stirred. Ask yourself, what do we want in this country, above all? People want to be happy, isn’t that right? […] Colored people don’t like Little Black Sambo. Burn it. White people don’t feel good about Uncle Tom’s Cabin. Burn it. Someone’s written a book on tobacco and cancer of the lungs? The cigarette people are weeping? Burn the book. In 2017 the silencing of ideas, whether spoken or written occurs without the flamethrowers of Ray Bradbury’s firemen. Indeed, it occurs without smoke or fire at all. The advances of technology have relegated actual burning of books and, at times, their authors to the dustbin of history. In our modern commercialized and digital age, content may be “burned” with the click of a mouse. The book that is not found on the Internet, for all practical purposes, does not exist. It is worth noting that the mainstream media avoided even mentioning that the recent banning occurred. Greenhaven press primarily publishes academic books on social issues for American high school students. 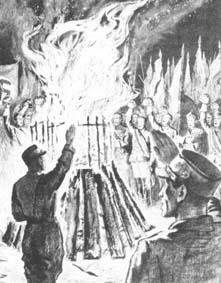 For more on the burning of The Revisionist on the campus of St. Cloud State University, see Smith’s Report No. 68, April 2000. Ray Bradbury, Fahrenheit 451 (New York, Ballantine Books 1996), p. 57. It is also worth considering the change in free speech on college campuses since Bradley Smith began his campaign to familiarize college students with what he called, “The Holocaust Controversy” dating back to the early 90s. J.S. Mill, On Liberty (New York, Penguin Books, 1985), p. 76.